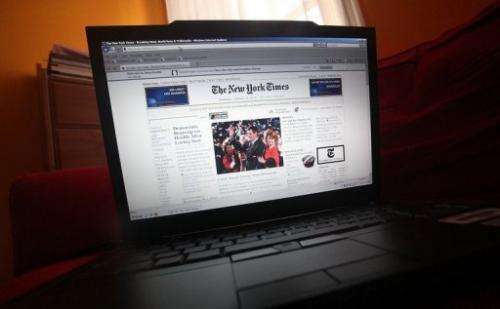 A photo of the NYTimes.com website on January 20, 2010 in New York City. The New York Times said its website went down Tuesday after what appeared to be a 'malicious external attack. The New York Times and Twitter have been hit with cyber attacks, with credit quickly claimed by a group backing embattled Syrian strongman Bashar al-Assad. The Times site remained out of service early Wednesday following the attacks, which began Tuesday. The Syrian Electronic Army (SEA), ironically, used Twitter to tout its efforts to take down the globally popular one-to-many messaging service and the Times news website. "Media is going down," a message at the SEA Twitter account proclaimed. "Twitter, are you ready?" While it was not clear if the attacks were in fact the work of Syrian pirates, they come as the United States appears to be gearing up for military action against Assad's regime as punishment for what Washington says is unquestionable evidence it used chemical weapons against civilians in the country's grinding 29-month war. The SEA has made itself known in recent months, hacking the Twitter account of The Associated Press to put out a false tweet saying President Barack Obama had been hurt in two explosions at the White House. SEA has also targeted the Twitter account of the AFP photo service, as well as social media at the BBC, Al-Jazeera and the Financial Times and Guardian newspapers. On its own web site the SEA said it defends the Syrian Arab people from campaigns led by Arab and Western media. The newest cyber attack was evidently aimed at the Domain Name System that acts as a directory of sorts for routing online traffic to website addresses. Hackers can hijack web traffic by altering DNS address information to send site visitors to websites of their choosing. An Australian domain registration service appeared to have been hit in the attack. "Our DNS provider experienced an issue in which it appears DNS records for various organizations were modified, including one of Twitter's domains used for image serving, twimg.com," Twitter said in a post at its status blog. "Viewing of images and photos was sporadically impacted," the San Francisco-based company's message explained. "No Twitter user information was affected by this incident." The trouble was resolved within two hours, according to Twitter. The New York Times said that its website went down Tuesday due to a "malicious external attack." Times spokeswoman Eileen Murphy also made the announcement on Twitter, two weeks after the newspaper's site went offline due to what it said was an internal server problem. Her full tweet said: "re: nytimes.com - initial assessment - issue is most likely result of malicious external attack. working to fix." The newspaper's main Twitter account said Tuesday afternoon that the website "is experiencing technical difficulties" but that news was still being published via Twitter and other links. Matt Johansen of WhiteHat Security said in a tweet that the technical aspects of the website during the outage were "pointing to Syrian Electronic Army." The Washington Post website was hacked this month in an attack blamed on the SEA. The Times said in January that hackers stole its corporate passwords and accessed the personal computers of 53 employees after the newspaper published a report on the family fortune of China's Premier Wen Jiabao.